I’m a user experience and interface designer with a passion to create exceptional and intuitive solutions for all sorts of platforms & devices. I have experience in designing interfaces for mobile devices (Android & iOS), web and SD & HD home television sets, for users between the age of 5 up to 99. In my 10 years of UI design experience I‘ve worked mainly in e-Learning/education, video on demand and e-Commerce. Designing user interfaces is not only my job but also my passion - a piece of heart and soul goes into every project. 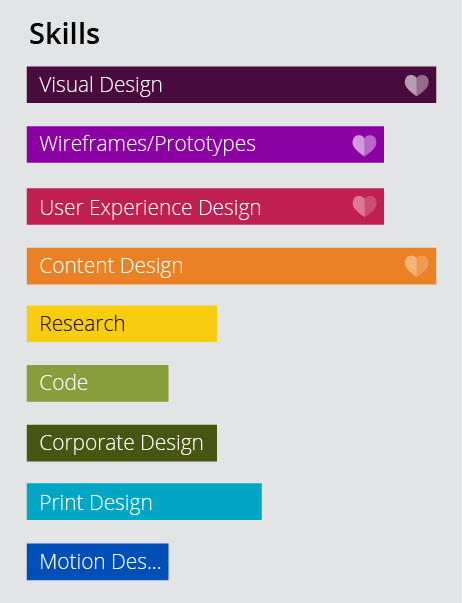 Though my main focus is on visual design I am typically involved in the entire UI design process: research, information architecture, functional specifications, interaction design, wireframing/prototyping, content creation and front-end development. I love working solo and within a team - team work for the joy of brainstorming and bouncing ideas off one another, solo for being „in the zone“ and working towards tight deadlines. I‘m always keeping up-to-date with the latest UI and graphic design trends & developments in the industry. I’m a pixel-perfectionist (some developers hate me! :)). I also have a wide background in print media design (12 years experience), corporate design and some experience in motion graphic design.